We're back! And, for very selfish reasons, I am really excited about today’s episode. Flash to Bang Leadership: Are You Reacting or Responding to Your Teams? Whether you’re a leader or someone who aspires to be one, one day, I highly recommend you read it. 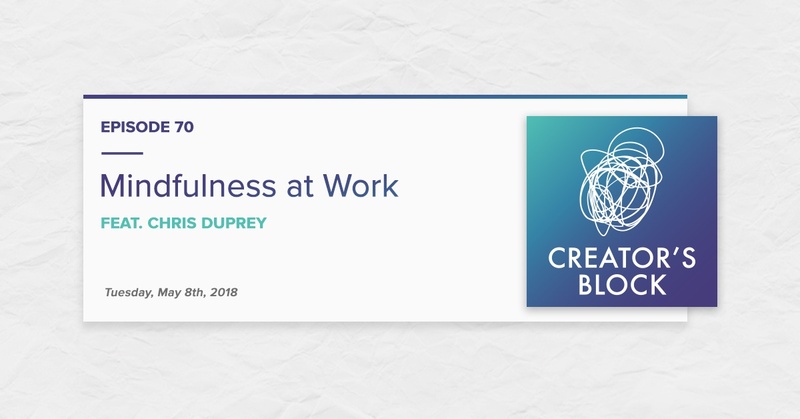 At one point in that original article, Chris discussed his mindful meditation practice, and how it influences his actions not only at home, but also at work. While he noted he's still a “beginner” with his practice, he brought up a lot of great points. “It has allowed me to live more in the moment -- to put things in perspective, before I respond. When you can create this space between stimulus and response -- maybe it’s through mindful meditation, or something else you find that works -- you are more present in the moment. However, as Chris also rightly points out, there are a lot of myths and misconceptions about mindfulness out there. Keeping in mind that none of us are mindfulness experts, we invited Chris back to the podcast this week to help us unpack mindfulness from the perspective of leaders -- or just professionals in general -- who have heard about it, maybe have some limited experience with it, but don’t really get the practical applications it can have not only at home, or at work. What do people not understand about mindfulness? How do people who can't focus embrace a meditation practice? What are our own personal experiences and impediments with mindfulness? What benefits have we seen from it -- if any? What advice do we have for people who are interested in trying out mindfulness for themselves? Why doesn't anyone in Connecticut know how to pronounce words correctly?